How Much Does an Emergency Room Nurse Make per Year? Emergency room (ER) nurses provide patient care and assist physicians, paramedics and other healthcare providers in emergency and acute care situations. In the US, ER nurses earn about $78,000 per year compared to Canada where earnings are about C$80,000 ($65,342 USD) and the UK where yearly income potential is nearly £44,000 ($52,266 USD). Emergency room nurses in Australia receive an annual salary of about AU$116,000 ($92,472 USD), a bit more than those in New Zealand who earn about NZ$97,000 ($70,830 USD) annually. On the lower end of the pay scale are South Africa and India at R309,000 ($23,242 USD) and Rs597,000 ($9,301 USD), respectively. Annual salaries vary worldwide by geographic region, professional experience, and work setting with additional details provided in this guide. The chart below displays earnings for emergency room nurses in select countries worldwide. Earnings for ER nurses vary with strong influence by geographic region and professional experience while work setting has a lower level of effect due to the critical care setting required for the work performed by these professionals. Additional information on salaries and a career as an emergency room nurse are provided in this guide. In the US, ER nurses earn an average annual salary of just under $78,000 per year, while those who earn an hourly wage receive about $37 per hour. Newly trained ER nurses earn an average starting salary of about $61,000 per year, increasing with experience and additional responsibility to about $91,000 annually. Bonus potential can add another $1,300 to overall income. Entry level ER nurses in Canada earn, on average, an annual salary of about C$63,000. With additional experience, senior level positions can garner more than C$93,000 per year. While the average annual salary for ER nurses is about C$80,000, hourly pay is roughly C$38 per hour. An additional C$1,300 in bonus potential is available to further boost overall earnings. ER nurses in the UK earn about £44,000 per year, or £21 per hour for those who are paid by the hour. During the early years of an ER nurse’s career, the average starting salary is more than £34,000 per year. Senior level professionals earn more than £51,000 annually. Some employers also offer bonus pay potential that is just under £1,000. Entry level ER nurses in Australia earn nearly AU$91,000 per year, increasing during the course of one’s career to more than AU$135,000 annually. While the average annual salary is nearly AU$116,000, the average hourly wage is $56 per hour. Nearly AU$2,000 in bonus income may be offered by some employers. In New Zealand, entry level ER nurses receive an average annual salary of about NZ$76,000, with earning potential steadily increasing to just under NZ$114,000 for those in senior level positions. The average annual salary is about NZ$97,000 per year, equivalent to about NZ$47 per hour. There is potential to earn an additional NZ$1,600 in bonus income. While entry level ER positions in India garner an average annual salary of about Rs476,000, senior level positions can bring nearly Rs709,000 per year. The average annual salary for all experience levels is about Rs597,000, while hourly pay is about Rs287 per hour. An additional Rs9,800 in bonus pay can further increase overall earnings. ER nurses in South Africa earn an average annual salary of about R309,000, or R148 per hour, with an additional R5,000 available through bonus pay. During the early years of one’s career, starting salary averages about R245,000, increasing to more than R364,000 annually for senior level positions. Salary data shows that professional experience is a consistent factor in earning potential worldwide for ER nurses. The gap in annual pay for entry level versus senior level positions are between 47% and 50%. For example, in Australia where annual salaries are the highest among the countries reviewed in this guide, senior level positions reap an annual salary of AU$44,000 more per year compared to annual earnings for entry level positions. This is a difference of 48%. The two countries with the lowest salaries for emergency room nurses, South Africa and India, see an increase of 49% in earnings for those at the senior level compared to their entry level counterparts. ER nurses work in hospitals in emergency situations where acute care is necessary to treat those with injuries or serious medical conditions. Due to this level of patient care, work setting is not a large influencer of overall salary levels. However, because some hospitals are nonprofit and others are for-profit organizations, those who are employed in a for-profit setting may earn higher salaries and have the opportunity for larger bonus pay. Most ER nurses work full-time hours; however, there are many opportunities for part-time employment. Full-time for nurses may be defined as between 36 and 40 hours per week. The hospital setting offers 24-hour patient care, and therefore, ER nurses may find themselves working during any day or time of day, including evenings, weekends, and holidays. Overtime may be paid for time worked in excess of the full-time designation. ER nurses often receive healthcare benefits that include medical, dental, and vision coverage. Paid time off is also offered for vacation, holidays, and sick time. Bonus pay is common for ER nurses, and due to nursing shortages in many areas of the world, hiring bonuses may be offered to incentivize professionals to relocate to underserved and low-staffed areas. Those who work part-time may be ineligible for the same level of bonuses and benefits. Licensure is required to work as an emergency room nurse, prompting some employers to cover fees and travel to continuing medical education training. Some employers also offer meals and lodging allowances for long hours worked. The US Bureau of Labor Statistics estimates a growth rate of 16% for nurses, including ER nurses, between 2014 and 2024. This faster than average growth rate is the result of a globally aging population, chronic health conditions, greater access to healthcare, and advancements in medical technology. 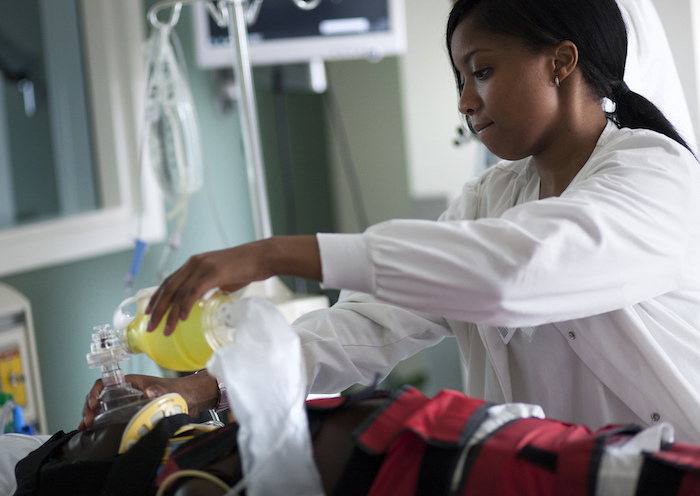 A career as an ER nurse requires a bachelor’s degree in nursing followed by additional on-job training. Those who hold a master’s degree may be able to demand higher salaries. Licensure is required to work as an ER nurse and registration must be completed with the appropriate regulating authority. ER nurses receive strong salaries and a comprehensive benefits package that includes healthcare coverage and paid time off as well as other incentives. While most emergency room nurses work full-time, there are sufficient opportunities for part-time employment. Faster than average growth is expected in this field, which will likely continue to support strong income levels while meeting the demand of newly trained emergency room nurses looking for employment.